[You may well be wondering what a page on Valve Amplifiers is doing here!? Well, it's another passion and if you know what valve amplifiers are and you're interested in buying one of the most configurable and elegant valve amplifiers around, please contact us to find out more! Our amplifiers sound amazing, look really elegant and can be set up in lots of different ways depending on your skill level and your interest in exploring this wonderful vintage technology]. The SAM-A1: A fully configurable Stereo Valve Amplifier. Enjoy the pure valve sound, without fuss, without hiss or hum and in a sleek and elegant package. *Picture of amplifier assembled in to custom enclosure coming soon! The SAM-A1 can be configured to use triodes or pentodes or pentodes as triodes. With pentodes the SAM-A1 will deliver between 8Wrms and 12Wrms in to 8Ohms depending on configuration; Class A, Class A to AB or Class AB Push-Pull all in Ultra-Linear mode. With pentodes as triodes the SAM-A1 will deliver between 6Wrms and 10Wrms in to 8Ohms depending on configuration; as pure Class A, Class A to AB, or Class AB output push-pull. The output valves are all controlled by fixed bias (the correct way to set up an output stage!). The bias is easily adjusted (with the cover on) to allow you to set how your output valves are driven. This means that absolute matching of the quad of output valves is not critical and we match our quads on what is important for achieving the best results in our amplifiers, using our own automated, computer-controlled valve tester. *1 These figures depend on the configuration of the output tubes, their bias setting, the specific quad of valves used and its age. As valves age they lose emission capability and require lower grid voltages to achieve a given bias point this limits how hard they can be driven before the onset of distortion. The input stage is open-loop so the two triodes used for the left and right channels should be similar in terms of their gain in the circuit; this does not mean that they are required to be perfectly matched, as both channels are adjustable (and you can chose to use adjustable, overall feedback). We match our input valves accordingly in our in-house computer-controlled valve tester. The second half of each triode is also not important from a matching point of view, since this is used as a unity gain inverter. The inverter stage can be configured as a Paraphase inverter or a Cathodyne inverter and both are adjustable to ensure both halves of the output drives are perfectly matched. The input stage can be traditionally biased, known as automatic bias, using a cathode resistor, or use LEDs to set the bias. Without entering in to a debate on whether or not it is beneficial, it is configurable. We chose to use overall feedback and this can be adjusted allowing the ‘brightness’ of the sound to be altered but also lowering overall harmonic distortion, reducing hum and making it very unlikely that powering your amplifier without a speaker connected will lead to oscillation, runaway and the destruction of your output transformers and output valves; but you can chose to remove the link and not have it! All bar the higher gain triodes (see Compatible Valves List) can be interchanged in the valve amplifier input stage, allowing you to experiment and try different valve types. The input stage is designed to allow a range of double triodes to be used, depending on what you want in terms of input sensitivity and on your preference for sound (and how it looks!). All of the valve types in the compatible valves list have been tried and validated against the design. If you are not certain if a type of valve that is not in the list can or cannot be used, let us know and we will investigate. If we think it will work, with or without modification we will let you know; send us the valves and we’ll test it! 6N1P 6H1П NOS Voskhod: The classic 6N1P tube from Voskhod, Kaluga, great sound. 6N1P-EV 6H1ПEB NOS Voskhod and Nevz available, Military ruggedised, extended life, version. 6N1P-VI 6H1ПBИ NOS, NIB, Nevz (Novosibirsk): Military Ruggedised version. Optimised for Peak/pulse current; great for punchy bass and for use in an output stage. 6N23P 6H23П Reflektor: Military ruggedised version. Fantastic sound, really clear highs and firm solid bass. 6N23P-EV 6H23ПEB Reflektor: Best of the bunch! Military ruggedised, extended life version of this great sounding triode. 6N6P 6H6П Nevz (Novosibirsk): Taller tube, higher power, double triode, designed for audio. Sounds similar to the 6N23P-EV i.e. excellent; Two versions stocked, both NOS. 6N2P-EV 6H2ПEB Voskhod: NIB & NOS: With a modified circuit, provides higher i/p gain, for lower input signal applications. Impeccable sound, Military ruggedised, extended life version stocked. Note: all of these valves can be ‘rolled’ in to the input stages without modification, with the exception of the triple Mica 6N2P-EV valves which have higher gain and require different resistors to be used on the PCB. 6P14P 6П14П The 6P14P is a great equivalent to the 6BQ5/EL84 pentode but with higher power capability, (14W not 12W anode power). Reflektor valves stocked NOS. 6P14P-EV 6П14ПEB Military ruggedised, extended life version of the 6P14P; Reflektor valves stocked. NOS and NIB. 6P14P-ER 6П14ПEP The ultimate Military verison of the 6P14P; specifically selected for stable characteristics over its life; reflektor valves stocked, NOS and NIB. Note: all valves/tubes supplied with the SAM-A1, or for use with any of our amplifiers will be provided with the test results for each tube. Different grades are available for most of the tube type we stock and they are available with different grades of matching. We will never supply a set that cannot be used with your amplifier and that do not sound right for their type; having matched a set appropriately, we will test them in our own amplifier before supplying them. The Power supply; the heart of any good amplifier! The Mains Transformer is designed and rated to cover all variations of the SAM-A1 amplifier; it has been wound and screened to minimise magnetic fields and hum ­ even driving very sensitive speakers, you will be hard pushed to hear ANY hum (measured output at idle less than 3mVrms). 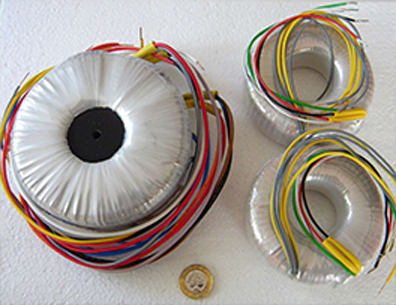 The mains transformer has multiple input windings, 210, 220, 230, 240, 250Vac 50/60Hz. In its simplest terms, this will allow you to choose the most appropriate winding to match your mains supply. The Output windings provide AC power to the Power Supply Unit (PSU) and to the valve heaters (yes we use ac heater supplies ­ and no, in the SAM-A1 valve amplifier design, this does not cause hum!). Changing your Mains Transformer input winding choice also allows you to decide how hard to drive the heaters on your valves ­ with our preference being simply to stick as close as we can to the mid specification for the valves. We can go in to more detail on the truth about, advantages and disadvantages of varying heater voltage/current/power if you wish! Yes, it might be a bit of an over-kill, but the SAM-A1 PSU provides fully regulated DC supplies to the valve anodes of the input stages, fully regulated DC to the anodes of the output stage (yes regulated output stage supply!) and fully regulated negative dc for the fixed bias on the output stages. What this means is that via links on the PCBs the amplifier can be configured for many different options, to use many different valve types to allow you to set up the amplifier to your preferences and try different valves to achieve the sound you are looking for! 205 to 255Vac 50/60Hz by transformer winding selection. 8Ohms impedance; Power Out entirely dependent on valve configurqation, please read text. -3dB response better than 5Hz to 50kHz at 1Wrms out. the sockets add 20mm - it then depends what you plug in to them and the depth of your mains inlet plug. The knob on the front adds another 20mm (depending on the knob fitted). The standard feet add another 3.4mm to the height, the dominating factor is the choice and height of the valves fitted. Remember that sufficent clearance is required above the valves; they get hot! 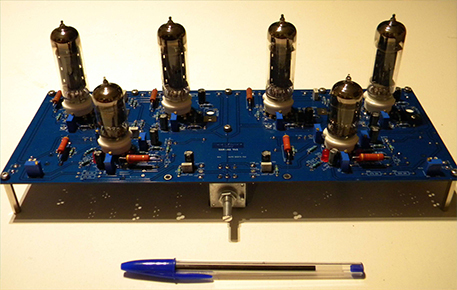 Right now the SAM-A1 stereo valve amplifier is available in kit form. We can either provide you with a full kit with everything you need to build the complete amplifier yourself, or we can offer a PCB (Printed Circuit Board) build service. Obviously if you opt for the PCB build service, you need to decide what configuration you want before ordering (input valve and inverter type, output valve type ­ triode, pentode as triode or pentode). The PCB build service allows you to order assembled and tested PCBs and if you order a set of valves with the PCB we can set the amplifier up to your specifications. All you will need to do is assemble the enclosure, mount the PCBs and transformers in it, wire it up and plug in the valves. Be warned; the voltages and currents required inside valve amplifiers can be LETHAL. Disclaimer: Building and modifying valve amplifiers is DANGEROUS. Valve amplifiers invariably use high voltages, both Direct Current (DC) and Alternating Current (AC) which are also available at high currents: the combination can kill you. The kits and amplifiers are supplied with instructions but it is your responsibility to operate in a safe manner at all times to avoid electrocution of you and others and to make the products safe to use. FSL accept no liability for your negligence.